Leo the Great was born in Rome, probably of Tuscan parentage; of his early life, there is no record. He served as a deacon to Pope St. Celestine I and Pope St. Sixtus III. Elected pope while away in Gaul (modern France), he was consecrated and started his pontificate by preaching ninety-six sermons that stated his opposition to the heresies of his time. The Pope from 440-461 and only one of three popes (with Gregory I and Nicholas I) to earn the title “the Great,” St. Leo is called “Great” because of his significant ecclesiastical, theological, and political achievements. Leo’s pontificate was important in several ways: He formulated the doctrine of the Incarnation, solidified the office of the pope, and sustained Rome when the walls were tumbling down. Leo’s statement of the doctrine of the Incarnation of Christ, (Tome) acclaimed at the Council of Chalcedon (451), has often been regarded as one of the highlights of Christian history. As in his other writings, so in this one, he showed remarkable clarity of thought and felicity of wording. Jesus Christ, he taught, is one Person, the Divine Word, in whom the two natures, human and divine, are permanently united without confusion or mixture. When the council heard this document read by Leo’s legates, they cried, “Peter has spoken through Leo.” It became thenceforth the official teaching of the Christian Church. Throughout his reign, Pope Leo consolidated and increased the influence and prestige of the papacy. In his writings and actions shone a deep conviction that the doctrinal primacy of Rome was of divine and scriptural authority. That, as the heir of Peter, the bishop of Rome exercised a supreme and universal authority over the Church and a primacy over all bishops. Not every bishop accepted his authority without question, but Leo’s teaching and behavior definitively shaped the papacy. He is credited with advancing and stabilizing the Church in a critical era by forging a central authority that evidenced wisdom and action. 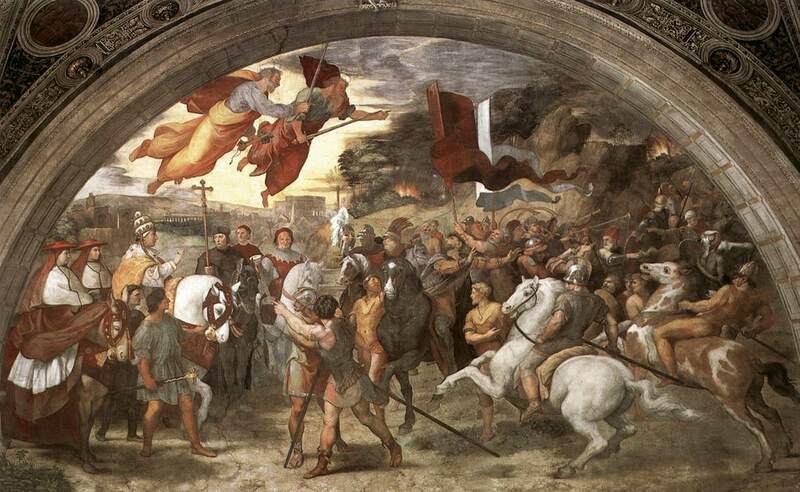 Raphael’s The Meeting between Leo the Great and Attila depicts Leo, escorted by Saint Peter and Saint Paul, meeting with the Hun king outside Rome. The fresco was completed after the death of Julius II (pontiff from 1503 to 1513), during the pontificate of his successor Leo X (pontiff from 1513 to 1521). In fact the latter appears twice in the same scene, portrayed in the guise of Pope Leo the Great and as cardinal. According to legend, the miraculous apparition of Saints Peter and Paul armed with swords during the meeting between Pope Leo the Great and Attila (452 A.D.) caused the king of the Huns to desist from invading Italy and marching on Rome. When Attila the Hun was about to sack Rome in 452, Leo personally turned him away by persuading him to accept payment of a tribute. Three years later, however, Leo tried the same tack on the Vandals, but they ravaged the city and took many prisoners to Africa. Beaten but not defeated, Leo sent priests and aid to the captives. At this time of momentous change, the saint led the Church and society with a hopeful spirit, restoring buildings, organizing relief for the hungry and the sick, and defending the faith. Leo’s character was described as one of indomitable energy, magnanimity, consistency, and devotion to duty. He died in Rome on 10 November and was buried at St. Peter’s, Rome. Bunson, Matthew, Margaret Bunson, and Stephen Bunson. “Encyclopedia of Saints-Revised.” Indiana: Our Sunday Visitor, 2003. Farmer, David. “Oxford Dictionary of Saints.” New York: Oxford University Press, 2011.